We love reading thrillers and when they are blended with Indian mythology they are unputdownable, if written well. 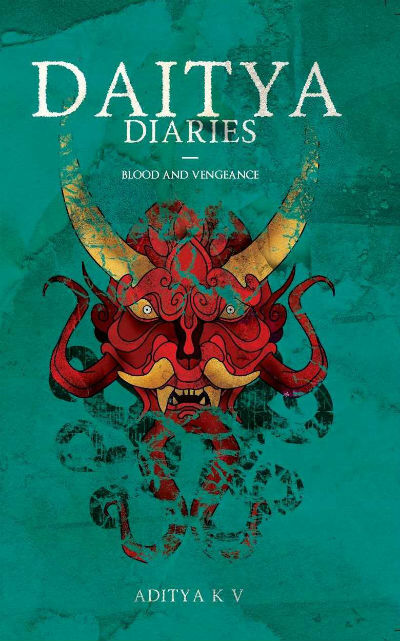 Before a couple of months, we were provided a book named Daitya Diaries (Blood And Vengeance) (penned by Aditya K. V.) by Leadstart Publishing (who are the publishers of the book). So, we were curious to read it at the earliest and share our unbiased book reviews with you all, but, based on the long book queue, it took us a while. Aditya K. V. makes his debut as an author by Daitya Diaries. In this book, he, however, tries to pull strings and connect dots among many historical and mythological incidents, that most seasoned authors try. Aditya doesn’t disappoint in his debut venture. The book was first published on https://www.kahaniya.com/. Here is the direct link to the book:https://www.kahaniya.com/s/daitya-diaries. Author : Aditya K. V.
Should you judge a book by its cover? No way. But, a book cover play a significant role in book purchase and reading decisions for sure. So having an attractive cover helps book selling at an extent. Of course, the story within is the main factor and without that being strong and gripping everything else fails. Let us take a look at the cover page of Daitya Diaries. As you can see, the cover page is quite interesting. An illustration of Daitya shows a face with long side teeth and horns, as expected. The red, black and white color combination reflects the brutality and the green background reflects the evil and piece both together. Overall, a thoughtful book cover, which is not super impressive, but eye-catcher for sure. It all started shockingly for Mallikarjuna, a young fellow living in Srisailam. He is an orphan, raised by the previous priest of the temple who possesses official permission from the government to be the tourist guide. He is in true love with a simple yet attractive girl from the town, Deepa, who despite knowing about his background, loves and trusts his qualities. Their marriage is on the book and Mallikarjuna need to earn extra, as much as he can. So, he can have a shelter, a place he can call home, for both of them. One day, he was assigned a duty to assist a few visitors scheduled to come later. The visitors, rather than visiting the main temple and other site seeing places, were curious to explore something in the jungle. And, that too in the dark night. Mallikarjuna was not interested in the job. If not for money, especially for his marriage and Deepa, he wouldn’t have agreed for the same, for any reasons. Of course, there are people, who hold influence by many means and whose requests are more of orders, which cannot be ignored. He, however, prepared himself for any upcoming danger by keeping a revolver with him. Not only the wild animals of the jungle but also the Naxals living around present a threat, especially in the ark time. He waited for his visitors at a crossroads who approached quite on time. They were three fellows having an intimidating persona. The incidents happened in the jungle has changed the course of Mallikarjuna’s life forever. What happened there and what were the consequences is something you would like to explore by reading this book. My main purpose is to talk about the book while keeping most of the spoilers at the bay, but it is quite possible to have a few; so please read ahead with the consent. I had seen many readers skipping about/preface/index/bibliography etc. areas while reading the book and thus often miss an important part of the book. The about section of this book is definitely worth read. The author seems to have read Indian mythology at a large extent, and even more importantly understood the core of the same. When Aditya mentions the following about Indian mythology, you will definitely start thinking a bit higher about him. Across Hindu mythology, every great man had a flaw, a very human flaw. The journey of Indian mythology is not of the absolute good and evil, but of the Ying and Yang, in every good there is a flaw and in every evil there is something to appreciate. The book is neither retelling of any mythology tale nor it claims to be. It is a fantasy fiction which travels from the real world to the mythological world. While there is a lot of myth and fictional stuff explored in the book, the author infused (maybe intentionally, maybe unintentionally) Science part also. Be it the description of weapon or potion, or any other supernatural stuff, there are various places where he presents some logical arguments which make you believe in it. No man can bear the influx of the cosmic energy more than what his body can contain, and Shankara, in whom they say contained over one third of the universe’s power uncapped his reservoir onto the world. The USP of this book according to me neither the fictional part nor the mythological part but (it is) the way historical stuff is weaved in the story with both those segments quite effective. The story is explored through various arena across India, but, that is not all. The story explores incidents happened in Mongolia, Pripyet, Chernobyl, Shurik (Soviet Union), Macau and others. In the fictional world, it takes the reader form Naraka to various layers of the universe to various mythological “loka” and that too in various time frames. While the description and incidents revolved around the river Vaitarni might not be that good. The central concept behind it, is quite interesting. While exploring a scene is a tough job, it is comparatively easier than exploring characteristics of a person. The author shows his expertise in the same at places in the book. Such people had a natural resistance to magic and simply could not be influenced by any other means. The author’s love for nature is evident in the book. … The corruption of men continued, and the entire race moved towards indulgence and materialism. They started to tax the cosmic energy for all their needs and greed. While we have heard and read phrases like “milking natural resources”, the usage of “tax” in that context is quite amusing. I also like these lines, which reflects the same thought we have discussed when talking about “about” section. Yayati was once a mortal. He was a great king, honest and fair to his subjects and someone who helped the world keep evil at bay, but even the greatest of our heroes fall to villainy. It is obvious to find words according to the environment the writer belongs to. In this book, we find words like Theertham, Maha Shivrathri, which might look obvious to the people living in one segment of India, but especially the readers from the northern part of India may consider it as a spelling mistake. Also, the author want to mention “Budh” and “Budha”, he used the word “Buddha” which connects wrong dots. The author when mentioning Yayati’s sons, wrongly mentions Turvasu as Yavana. As Years passed, Yayaati had two sons from Devayani – Yadu and Yavana; and three sons from Sharmista – ….. I must say that in the glossary, however, he mentioned all the names quite accurately. The appearance of the character of Ashwatthama reminded me of the book – Ashwatthama’s redemption– which I got a chance to read recently. By now you must have got an idea about the quality of writing and content in the book. It has its letdowns and flaws, but, on the whole it is a good thriller.